This 1950s chandelier was on eBay. 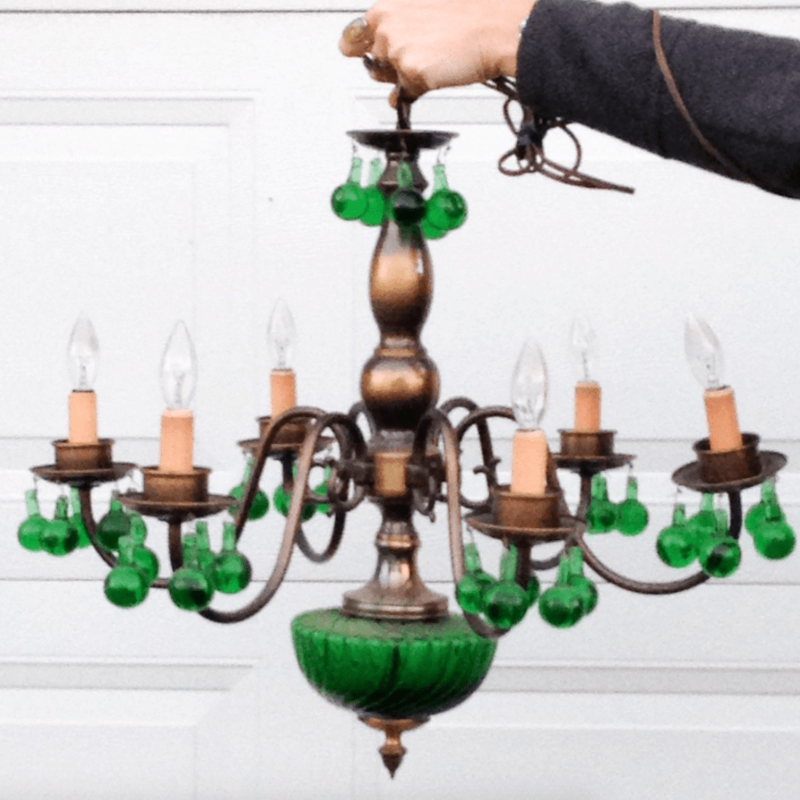 I had the chandelier on my Watch list over and over and over as it received no bids through numerous re-lists. Well, the opening bid was high. What worried me about the chandelier is that it had glass hurricane shade originally. You can see the little cups they rested in. Were they clear? Or green? The question was really moot, however, as I was NEVER going to find six matching period-correct shades in either green or clear. Never. But…but…those green hand-blown green drops were mighty enticing. As was the green bowl on the bottom. A week later the chandelier arrived and I stared at it. There was no way I could offer it for sale minus its glass shades. It just looked too weird. And the sockets were so tiny. Then an idea popped into my head. Quite the scandalous idea! I would alter the chandelier. Even though I pride myself on restoration, what choice did I have but to slightly renovate the chandelier? Well, you can judge the results. Should I be spanked? Or applauded? I removed the tiny sockets, and the glass shade filters, and installed larger “candles” with off-white cardboard covers. I also rounded up the perfect chain and ceiling canopy. 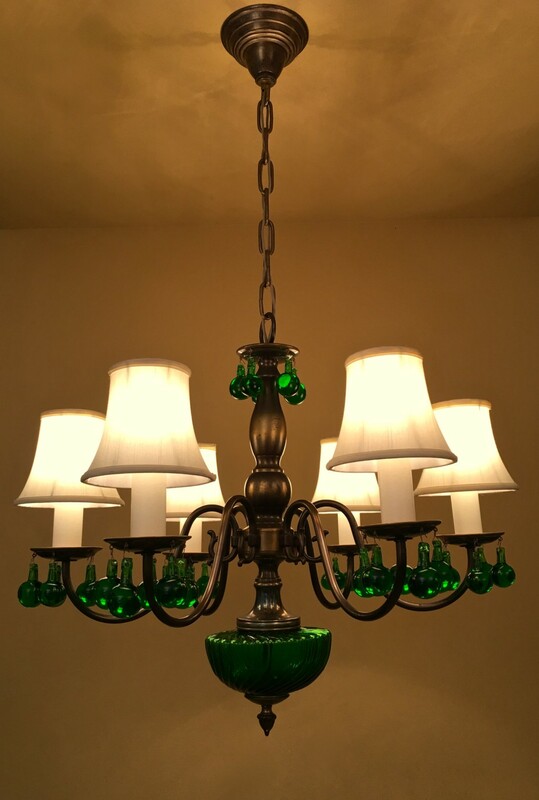 Briefly, I thought about ordering green shades but then realized they would detract from the GORGEOUS green glass. The glass needed no competition, dahlin’! I love the way it looks with the covers. The house I’m restoring has all the original lights, but if it didn’t there’s about ten lights I’m in love with that your selling. I just wish I had a beautiful old home to put some of your beautifully delicious lights in. A girl can dream!